Since from early boiling an egg is always being difficult especially for moms in early morning, when making breakfast for family. Because boiling an egg need your attention, time and presence, else it would not cook as you desired; half or soft or full boiled egg. 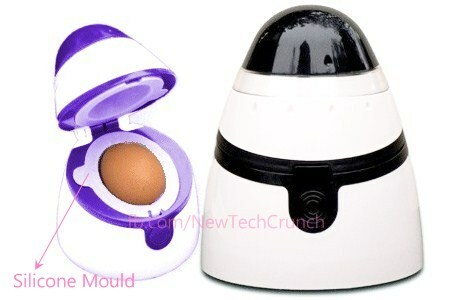 But, now the good news is that soon a new device named as Eggxactly is going to commercialize. Eggxactly is an electric device, designed to boil an egg as easy as to use toaster. The unique feature of Eggxactly is that it is water free. Now, if you are thinking How to boil an egg without water? So the answer is simple that water is being use as a medium to transfer heat. So, if we replace water to Silicone (or any other material) for heat transfer from heat source to an egg then definitely we can cook an egg without water. First of all open device lid and place an egg in a soft silicone mould, which is especially designed to cover and make a full fine contact with any kind of egg. Then close lid and rotate the dial to set the time according to desired doneness. In last tap the device from top in order to start its work. It is also able to measure the initial temperature of egg and then give heat according to it. Once egg is cooked it will aware by a beep. Eggxactly is smart device, and one more thing which makes it differ from oven is its energy consumption. It required only 1% ±0.2 of total of energy which oven required. You can buy Eggxactly in price of only 38 USD or approximately in 4000 and 2200 Pakistani and Indian rupees, respectively. You also have an choice to select cooker in your favorite color or in matching with kitchen.